I’ve received a couple of pm’s regarding AU lab and setting it up for live use (largely from this post). With an upcoming film accompaniment and a need to re-tool the setup a little I thought I would build a rig from scratch and explain how I’m doing everything. What I am doing here is documenting the specific process for building a working rig for myself. If you don’t have this specific hardware/software set up, you could adapt the process to whatever you’re using. First a bit about AU Lab. If you have a Mac Laptop with an OSX operating system, you have access to one of the greatest FREE music applications imaginable. 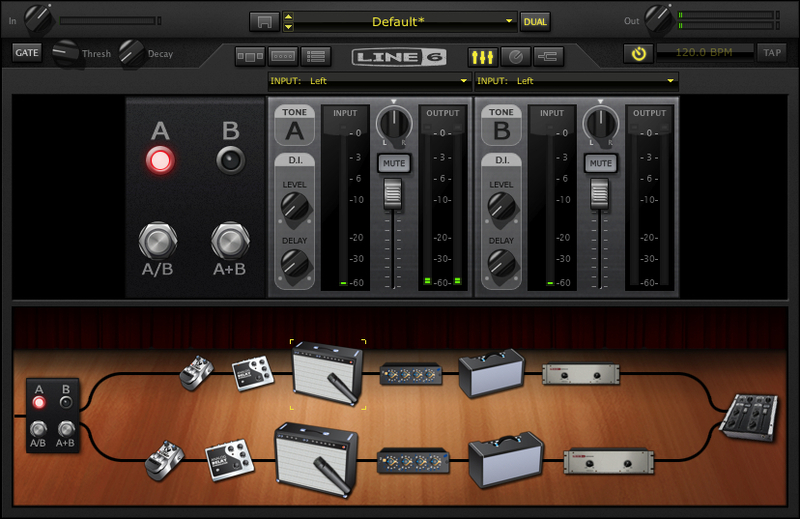 AU Lab is a program that was designed for AU (Audio Unit – The Mac proprietary plug in standard – much in concept like a VST) developers to test plug ins – but since it can accept audio and midi, has buses and can record audio – this makes it a great tool. The fact that it does it with a fraction of the CPU of something like Logic makes it essential. 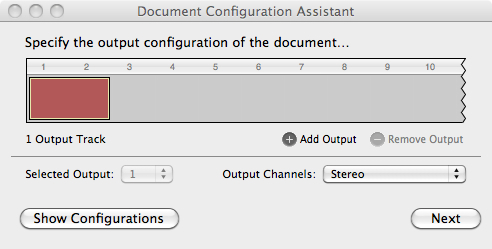 AU Lab can be installed as part of the SDK package that is on your OSX install discs. If for whatever reason you can’t find your discs – you can go to the Apple Developer site and sign up for a free account. You can then download the SDK package. Once it’s installed it should be in folder called “Developer” but if you just search for “AU Lab” on your computer it will come up. 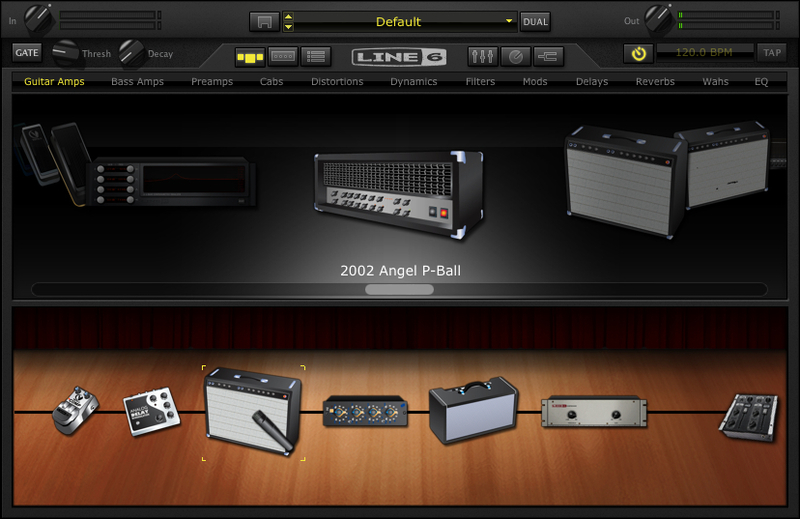 The UA LAB Version used in all of these examples is AU LAB Version 2.1. Version 2.2 has not been stable on my system with the Apogee Duet. You can read about the current version here – but in the meantime – you may want to download X code 3.2.2 Developer’s Tools – which has version 2.1 of AU Lab, if it isn’t installed on your system already. FNH custom guitar: You can find a full review of this guitar here. Macbook Pro- 2.4 Ghz Intel Core 2 Duo. This is actually a 2008 version I got with a killer educational discount. 15” with firewire 400 and 800. This Macbook has had 4 gigs of memory that I got from OWC (although the first slot can take 6 gigs so I’ll probably upgrade that before the end of the year) and a Seagate 500 gig 7200 rpm drive. I underestimated just how important the internal drive was to performance but it made a very big difference. Lacie Rugged Drive – This is the 320 gig bus powered version. Also 7200 rpm. I run it on the firewire 800 port and use it to record to. It’s a little overkill – but I can use it for larger sessions as well. 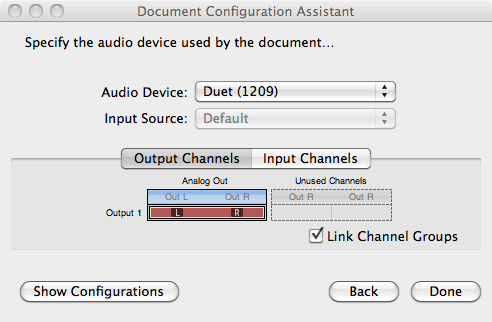 Apogee Duet – Firewire interface. No other A/D converter near this quality in this price range – No question about it. 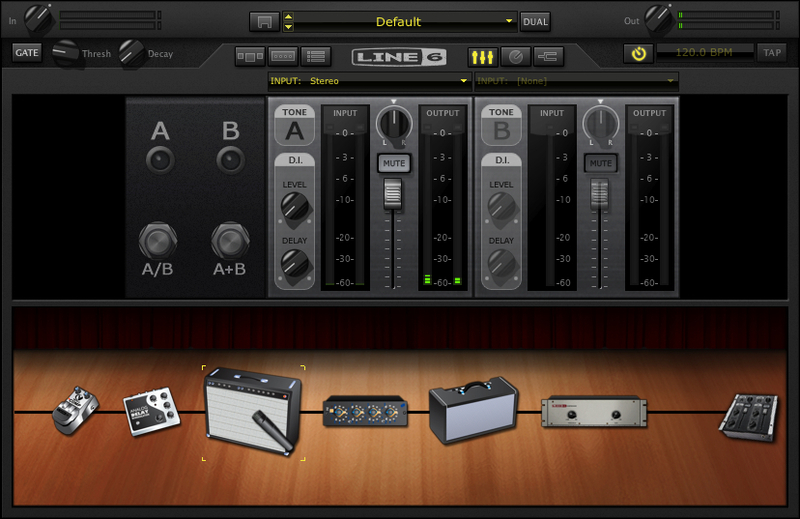 Line 6 FBV shortboard Mark II – Line 6 got it 100% right with this product. Smaller than the old shortboard, but can be USB powered. Ilok key – This is required for the Ilok version of POD Farm. Korg nanokey – The keyboard for this is a little toylike – but I’m not a keybaordist. It is velocity sensitive and kits in a laptop bag – and I can use it to trigger patches, samples, etc. I think all the Korg nano products are really cool. Very useful item. Apiotek USB 2.0 Quad – This is an express card adaptor that opens up 4 usb slots on the computer. Since the Macbook only has 2 USB ports and I have at least 3 usb devices – this is REALLY helpful. If using this hardware you will probably have to use one or all of these at some point. This will be a VERY indepth tutorial – but I want to make sure I cover everything I can. I want to run a stereo channel out so this is fine. Notice that the default setting has no input – you can change this later – but it helps to set it up now. Now you have an input source. 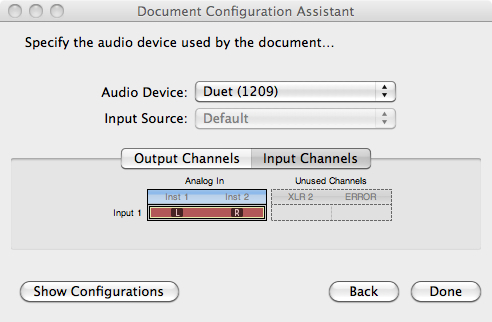 In this case I’m using the Duet – so it came up as the default in the Audio Device field. If you’re not seeing the audio device you want to use open Audio Midi Setup (in the Applications – – > Utilities folder) and make sure you see it there. This shows that the Left/Right 1/4” ins are both available. I’ll only be using Instrument 1 for the guitar – but I could run another instrument if I wanted to. Here’s the screen that you’ll get. If you have your guitar plugged in and strum a chord – you should hear it. But this is going to get a lot better. The first step is to set up PodFarm: Click on The Effects tab in Audio 1 and scroll down until you get to Podfarm 2. What I’m going to do here is set up a clean and distorted channel that I can switch back and forth between and automate some of the parameters so I can change them with my shortboard. The First thing to do is get the input sorted out – since I’ve selected a stereo input in AUlab – the default in Pod farm will be a stereo in. I only need the left channel in as I’m only using 1 guitar for right now. If I click on the arrow to the right of input: Stereo and scroll down to left – I now have the Instrument 1 Input on the Duet (left) as the input for this channel. 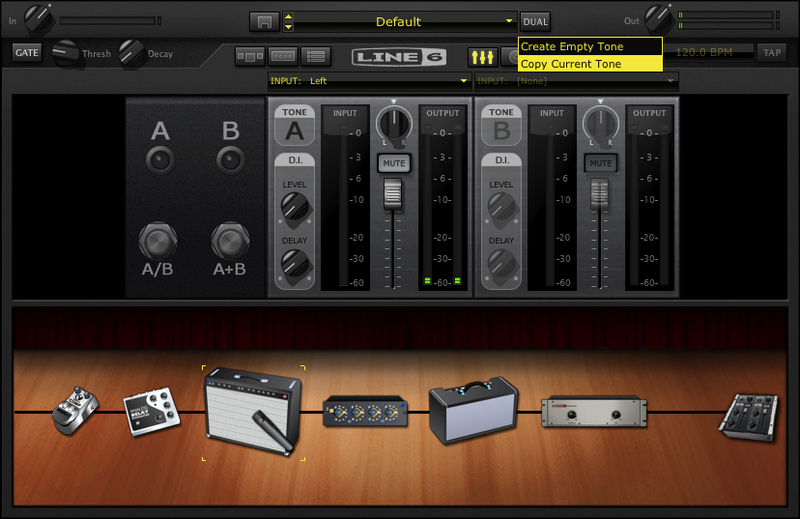 If I click on the tuning fork to the right of the Line 6 logo – that opens the Tuner. 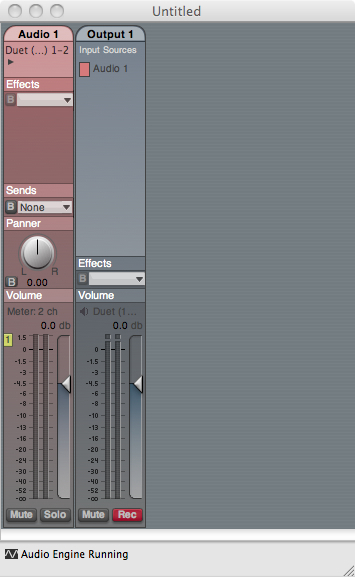 The next step is to create a Dual Tone. In this case I’ll just copy the current tone. Click the dual button and select Copy Tone. Note that the input has stayed the same as well. 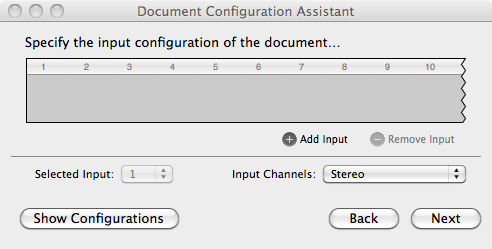 Now my single guitar input can be used on both channels. In general, I haven’t had a lot of success with 2 channel sounds – particularly distortion – which tends to overload in unpredictable ways. I’ve clicked on the A+B Switch to turn it off. The first time I did this – the guitar tone was digitally distorting (unpleasantly) so I brought the output of PodFarm down and it was still an issue. Once I opened Apogee Maestro – the utility that came with the Apogee Duet – I realized that the signal coming out of the Duet was too hot. It’s important to realize that the more items you add, the more things you’ll have to check when it goes wrong. You may want to save the AU LAB session and save the POD Farm patch as well. AU Lab saves all the settings of all the effects in the session, but you need to save the patch in POD Farm to load it again. 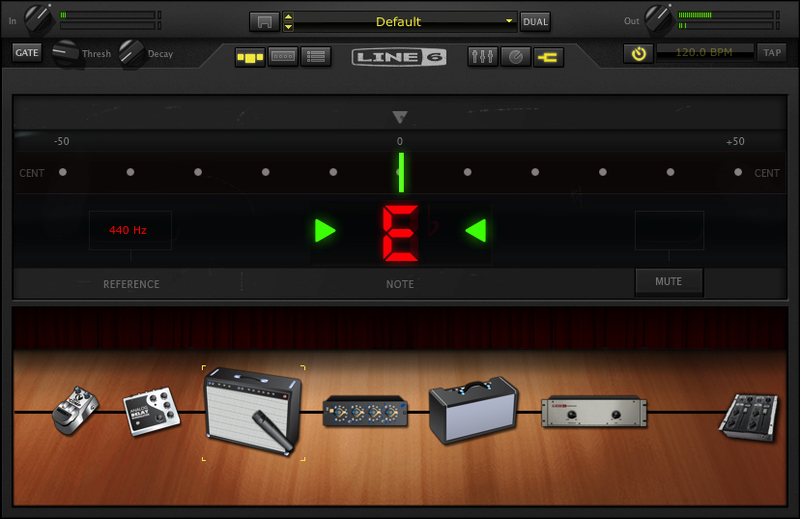 In future sessions, I’m going to create an A/B rig with a dirty and clean guitar amps and use the midi learn functions to change effects with the Line 6 Shortboard. You can find all of the laptop guitar rig posts on the Blueprints tab on the top of the page. Once on the blueprints page – just scroll down to the Laptop Guitar Rig section. This entry was posted in Gear, Guitar, Guitar Tone, Laptop Guitar and tagged Apogee Duet, AU Lab tutorial, FnH Guitar, Guitarchitecture, laptop guitar, Laptop Guitar tutorial, line 6, Pod Farm 2 Platinum, POD Farm 2.0 tutorial, RedWirez, Scott Collins, SooperLooper by GuitArchitecture. Bookmark the permalink.